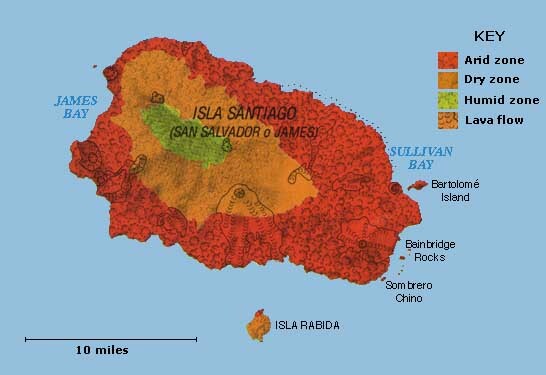 Santiago, often called James, is the Galapagos' fourth biggest island, with an area 226 square miles. It is more elongated than some of the other islands, about 22 miles in a northeast-southwest direction and 14.5 miles wide. The highest point is 2,974 feet. It is also called San Salvador or Chavezsure to confuse an unsuspecting tourist! The English named it James after King James II. The Ecuadorians called it Santiago (from Spanish for Saint James) in 1832 after their official independence from Spain. Wild donkeys are a major problem on the island as they have destroyed large areas of native vegetation. The Galapagos National Park Service is presently engaged in an eradication program and have significantly reduced the number of donkeys.